Before moving to Bangkok we honestly thought that the seasons were much the same but we are now fully appreciating the meaning of ‘hot season’! We were out at 5am the other day to extend our visas at Immigration and were surprised to find ourselves dripping with sweat even at this time! 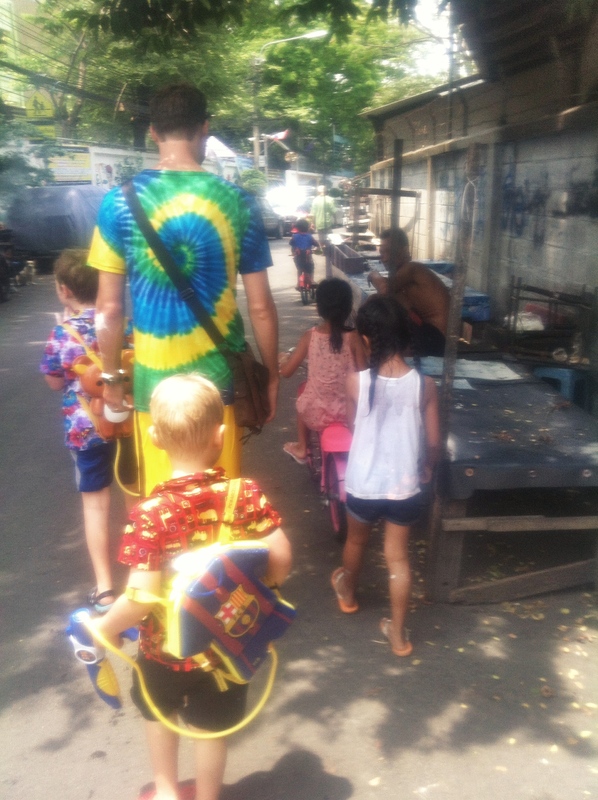 The Thai schools have holiday through April and May and life slows down considerably as even the smallest tasks become exhausting. This means lots of hot bored children waiting on the doorstep! We are missing the air-con at Language School but enjoying a month off to concentrate on other things. There is still plenty of opportunity to practice conversation so hopefully we won’t forget too much! April began with celebrating the Passover and Good Friday alongside friends in house-church. 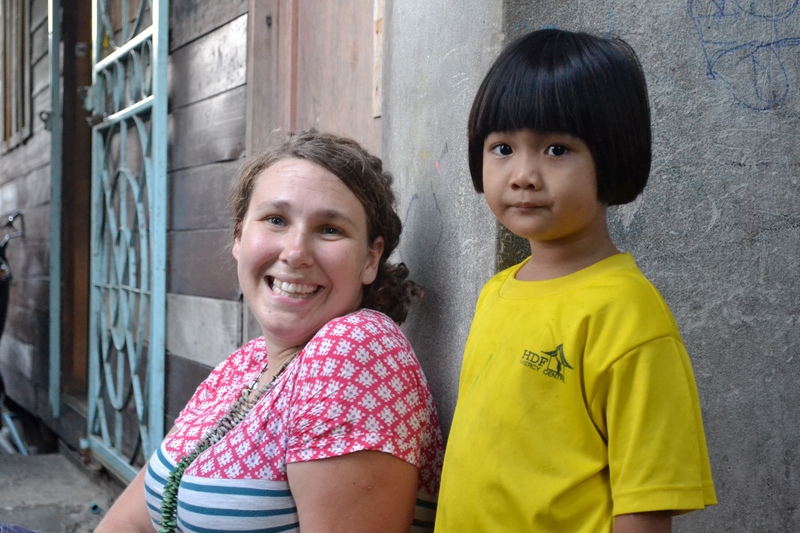 Hearing our team leader Alisha explain the message of Easter in Thai gave us a massive incentive to study hard. 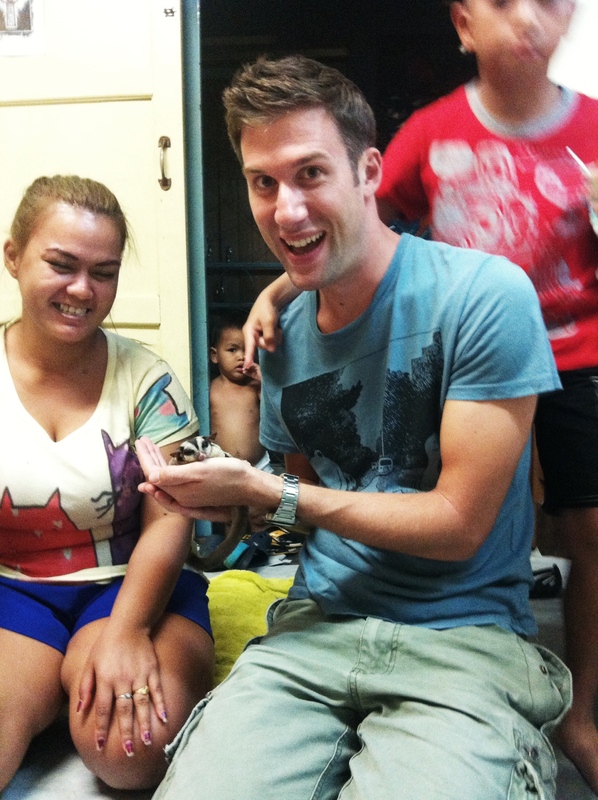 This was followed by a 14 hour overnight train adventure to Chiang Mai in the North of Thailand (every boy’s dream!!!). We went to stay with our friend Judy Cook who runs Hope Home providing full-time foster care for children with disabilities. 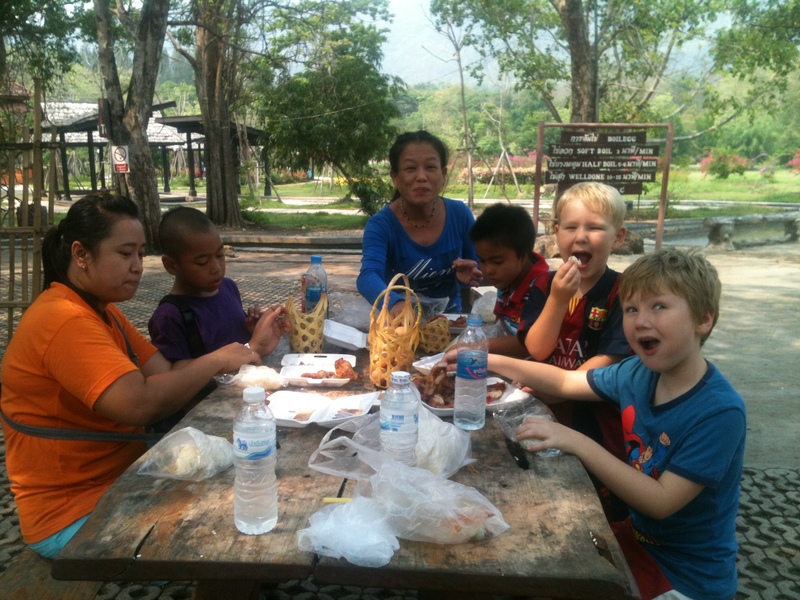 This is a very special place to us and we wanted to share it with some neighbours from Klong Toey. 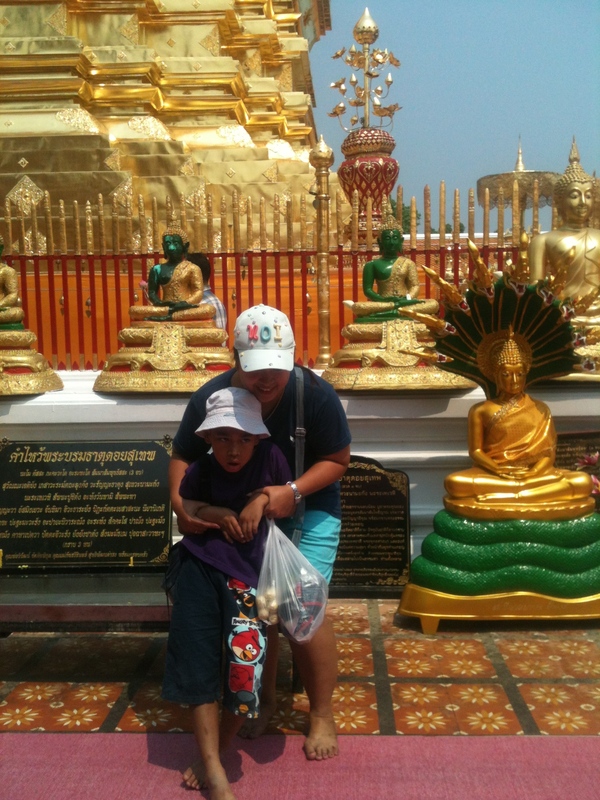 P’Noi works as an administrator in the UNOH office and is an incredible single mum to seven year old Bart. As a toddler Bart had febrile convulsions and the local hospital did nothing to bring down his fever and stop him fitting. As a result he has brain damage and caring for him is an exhausting job, partly because he is extremely capable and is always on the go. The two of them had not been on holiday before so this was a huge step. 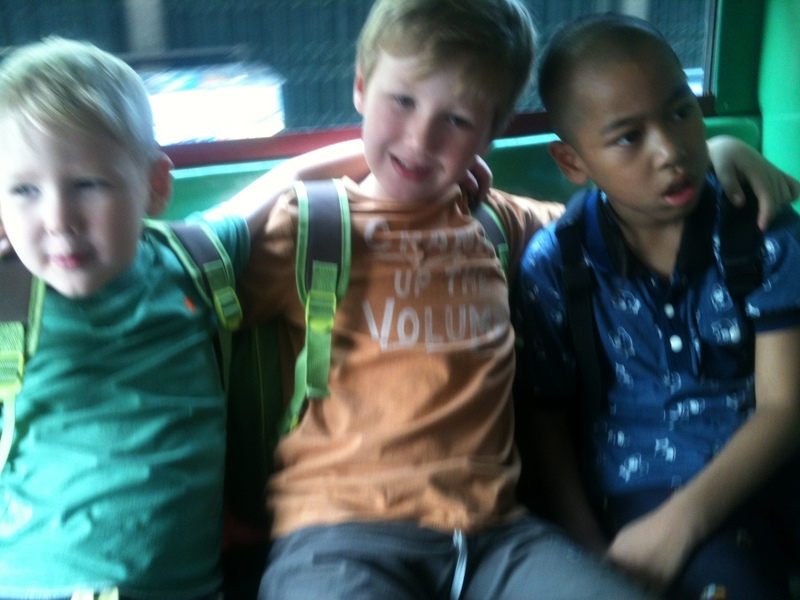 We all enjoyed visiting Chiang Mai Zoo, soaking in hot springs, climbing the 309 steps to Wat Doi Suithep, and taking a boat trip on the Ping river. It was hard work being out of the familiar and enclosed environment of home but sharing this time was significant for our friendship and we encountered Jesus powerfully in the way P’Noi cares selflessly for Bart. 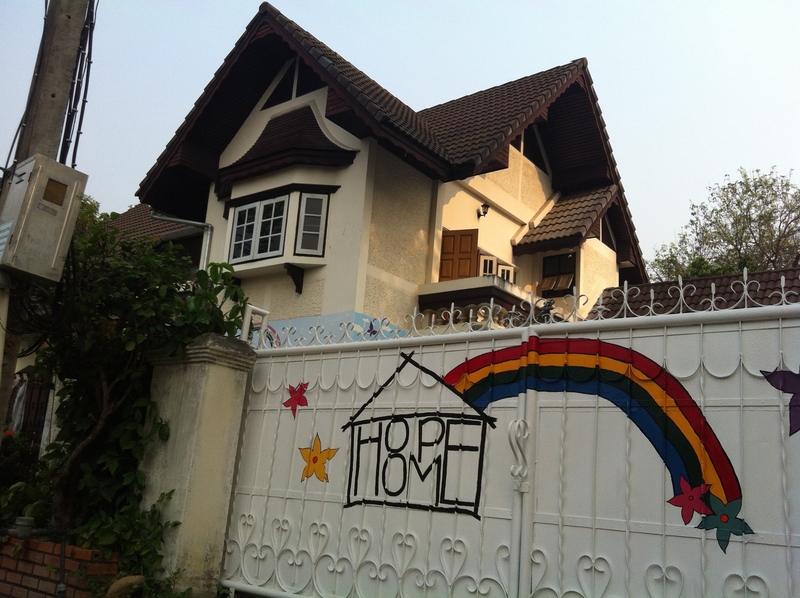 We are so thankful to Judy and the extended family at Hope Home for hosting us! Back in Bangkok we had our first experience of Thai New Year or ‘Songkran’ which is a holiday lasting for three days. There is a traditional emphasis on washing and cleaning but in modern times it has morphed into a giant three day water fight! This was fun for… um, lets see… half a day, and then it got annoying! You couldn’t walk or drive the bikes anywhere without getting soaked and covered in coloured paste! 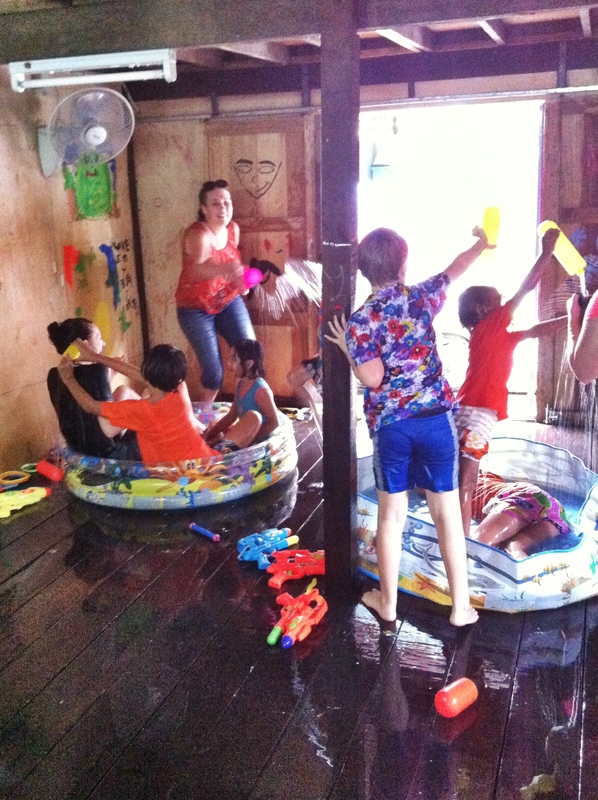 Our teammate Jo filled her house with paddling pools and all the kids had a wonderful time (the water could drip away through the floorboards into the swamp!). Unfortunately Elliot swallowed too much water on day 1 and got sick; we’ll remember that for next year! Evenings sat out with the neighbours were chilled and went on later than usual because most people weren’t working. It seemed to be a time for reminiscing with family, probably the closest equivalent to celebrating Christmas, and we felt priveleged to join in. 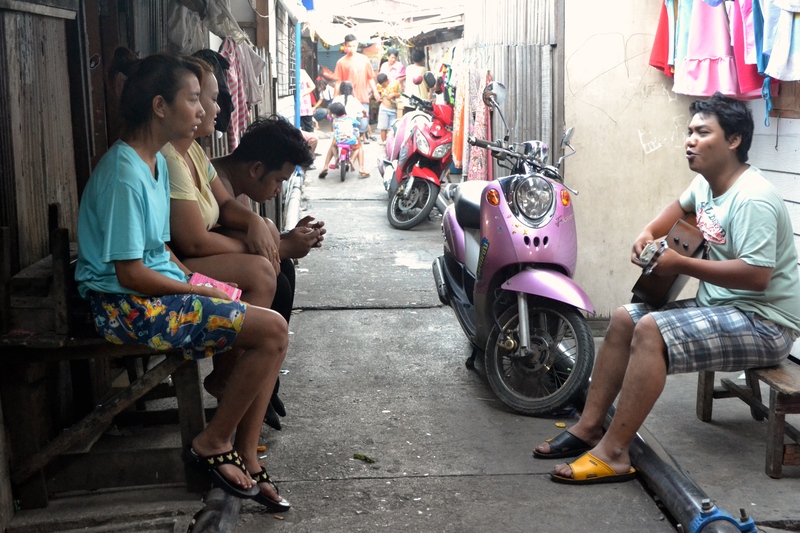 Our neighbourhood is all the poorer this week for losing its Father figure Lung Dtor. Despite not knowing him well, we looked up to him as a gentle, compassionate man in his 60s who, unlike so many others, made it his business to care. He had been unable to eat much for a few months and, after a spell in hospital, died after collapsing at home. One of our neighbours is particularly distraught. Loss of a father figure cuts deep when you’ve already lost your mother as a teenager and then spent two years in prison for drugs. Lung Dtor cared for her young daughter while she was in prison and then stuck by her as she subsequently turned her life around. We have attended parts of the three day funeral at Wat Klong Toey. This has been our first experience of death in a Buddhist culture and it has been fascinating to compare with our own cultural norms. We often need to remind ourselves that we are here to express our solidarity and to point to Jesus as the Hero. There is a strong temptation to apply quick solutions that may not fit the context or to patch up problems in ways that our neighbours can’t own or sustain. Being here as learners has its frustrations and we would ask you to pray for patience and insight that will build a good foundation for day 1,000 and beyond! We are currently doing some work on the house that we will move into when our apprenticeship year in Lok 3 finishes in September. 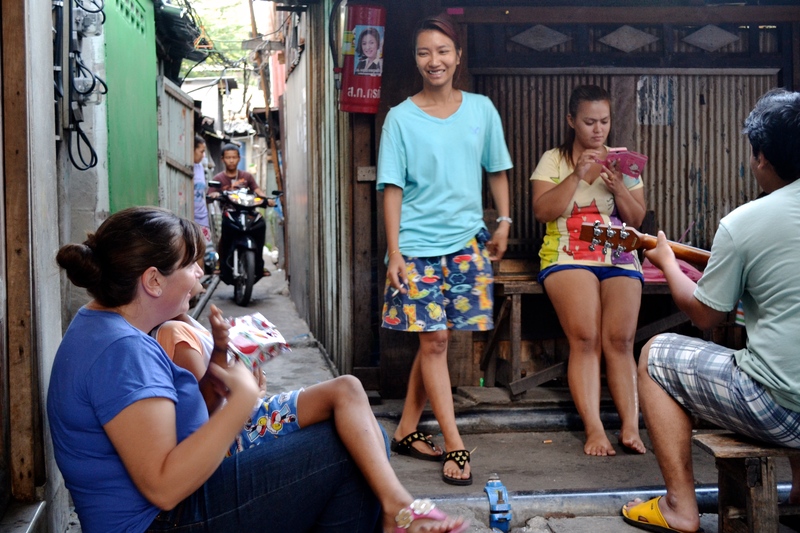 This is a good way to begin chatting with neighbours and finding out more about the area (for example that it floods terribly in rainy season!). The house is a good solid shell (left, featuring small dog! ), but requires some creative thinking about how we divide the 12 x 3.5m space effectively for ministry and family. We had no initial setup costs on arrival in Bangkok but this next move is hopefully long-term and will take some additional fundraising. 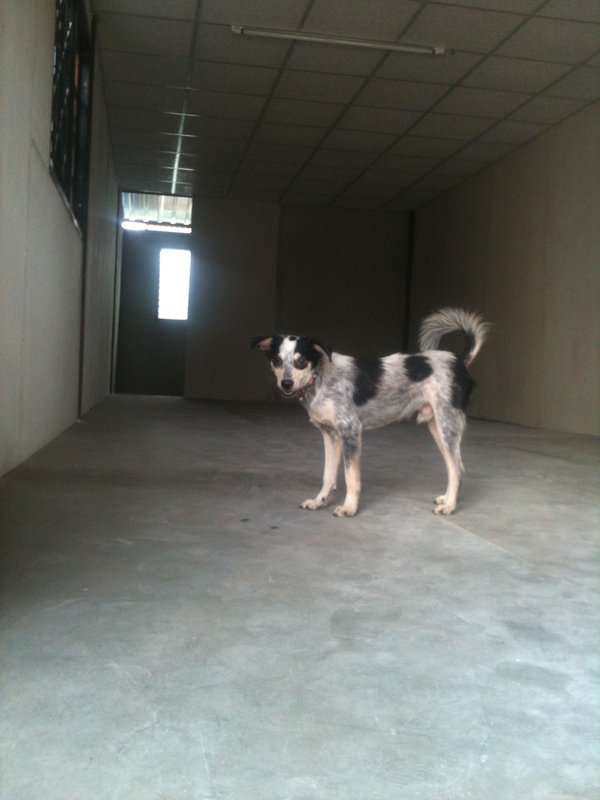 Any donations specifically towards renovating and furnishing the house would be gratefully received! We intend to set up a specific ‘Rong Moo’ fund so that anything extra raised can go towards future community building as we explore what it looks like to serve here. Please see the ‘Partner with us’ page on this website or email us for further information about giving. Sending our love and prayers from Bangkok!